When it comes to selecting the right countertop for the kitchen, the granite stone is the most preferred choice of them all. Granite stone has lot many advantages over the other stone choices and this makes them a perfect choice for the kitchen countertops. No matter how old the granite is, it will still draw your attention towards its unique colour combination and detailed grain designs. The granite installation is also a very easy process and can be done in a single day. 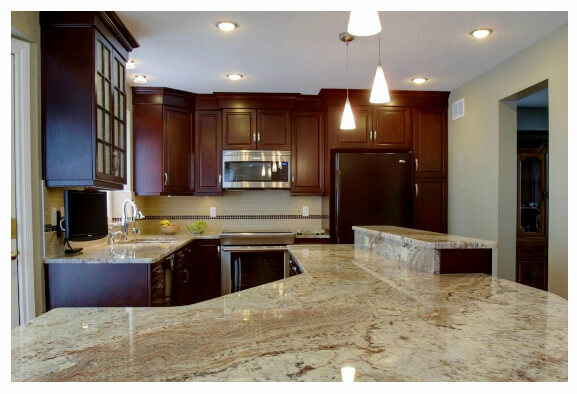 There are many Edmonton granite experts and you can get the granite choices from them. What makes granite suitable for the use of kitchen is its strong nature. Granite is resistant to dents and scratches and you don’t have to worry about anything while working on it. As we all know, kitchen is a place where use of knife and other sharp objects are common and many times you drop these things at the countertop too. If you have a granite stone, then you don’t have to worry about it getting any marks on the surface as it is strong enough to resist them. Granite is available in many shapes and sizes and you can opt for the one that goes with the rest of the decor in your house. If you have a special theme in the kitchen, then you can get the stone according to that so it matches not only the colour, but also gives it more elegant appearance. No two granites are alike due to their natural formation. As all the granites in Edmonton are procured from many different places, you can be assured that the stone you are getting has the most unique design out there. You can also have the granite in any size you want. It is available in big slabs and f you want to have a single slab countertop, then you can buy the single piece of granite. If you have a large countertop and want to finish it in some design elements, then you can get the granite in different shapes and then can add them up to give your kitchen a unique design. Granite also has a build in flecks of stones that reflect the light. If you have a ceiling light arrangement in the kitchen, then the countertop will reflect the lighting from the little flecks, giving your kitchen a very classy look. Granite is also resistant to stains. So if you accidently spill a glass of wine on the kitchen countertop, then all you have to do is to wipe the wine using a wet soft cloth and you will be done. You don’t have to use any special cleaning liquid to clean the top of the granite and it can be cleaned by using any normal liquid soap. Granites are the most user friendly option for the kitchen and they give you classy look and the functionality at the same time. Contact the Edmonton granite experts to get yourself this amazing stone right away.